We Rode The Tail of The Dragon……Rich’s Bucket List……. – …………. 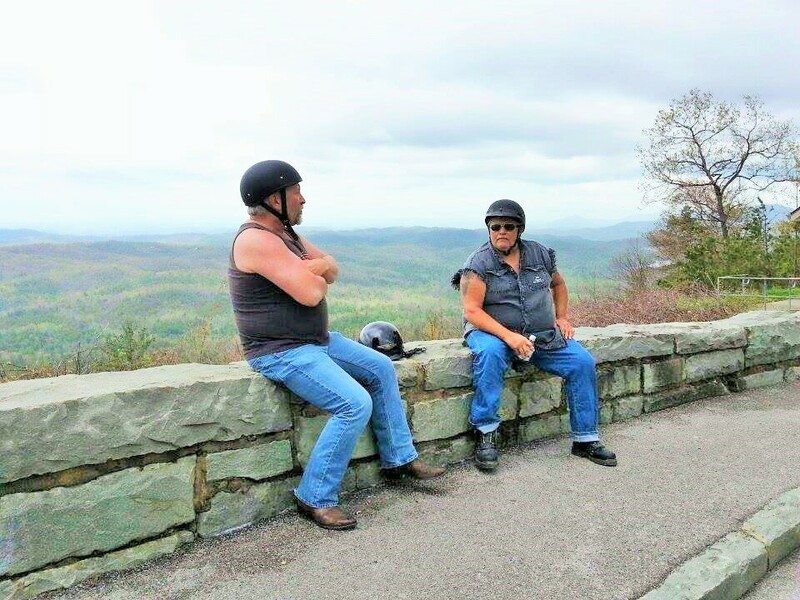 ''AND LET THE FUN BEGIN''……………..
We Rode The Tail of The Dragon……Rich’s Bucket List……. We left Chattanooga for New Tazewell Tennessee. We had to take the back way in the morning as the underpass was still flooded and closed. We now had to cut across the state of Tennessee catty corner. New Tazewell is an hour from Knoxville on the other end of the state. 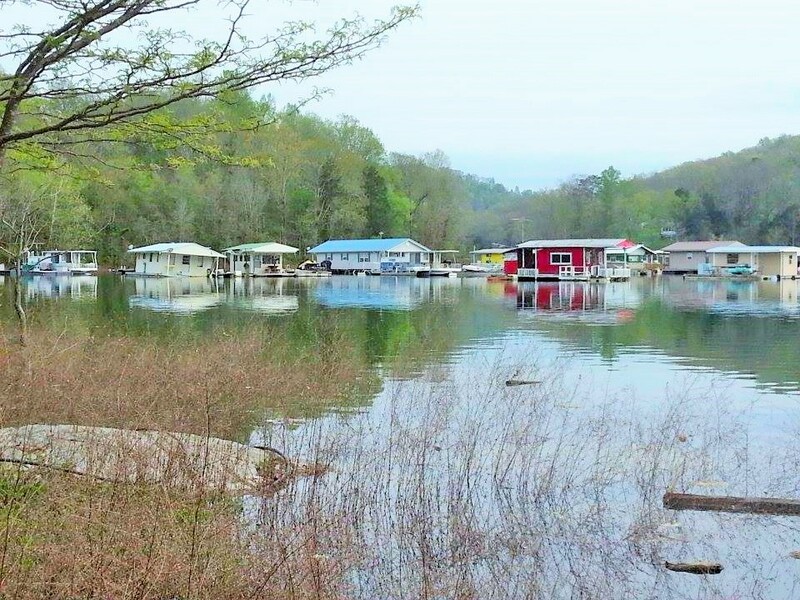 Julie had made reservations for us at the Cedar Lake Marina on Norris Lake…..An Absolutely beautiful area. She met us on the highway and took us in to the marina. So many boats and house boats….. I met Julie back in the 1990s, when we worked at Plano Molding. Chris was a supervisor on another shift. We worked 12 hour nites….ohhhh…what a long nite it was assembling tackle boxes and Caboodles. I could do it in my sleep…lol… Their were 5 of us that were close and we started going camping together….Me, Julie, Tammy, who is in Kentucky now, Dawn, and Mary. We had so much fun at work, (devious fun)…..lol…and also camping. Any other place we would have been fired immediately for some of the things we did, but that’s another whole blog….Ohhhhh we were such an evil bunch…lol…Julie and Chris moved to Tennessee over 12 years ago. Plano opened another branch their and he became plant manager. We were down couple of times to visit, but its been over 10 years ago. Way over due for a visit. The next morning we went to their house and took off. Now Chris had decided to take us to the Dragon…..I had NO IDEA where or what it was. It turned out it was on “Richs bucket list”, but he had given it up along time ago. 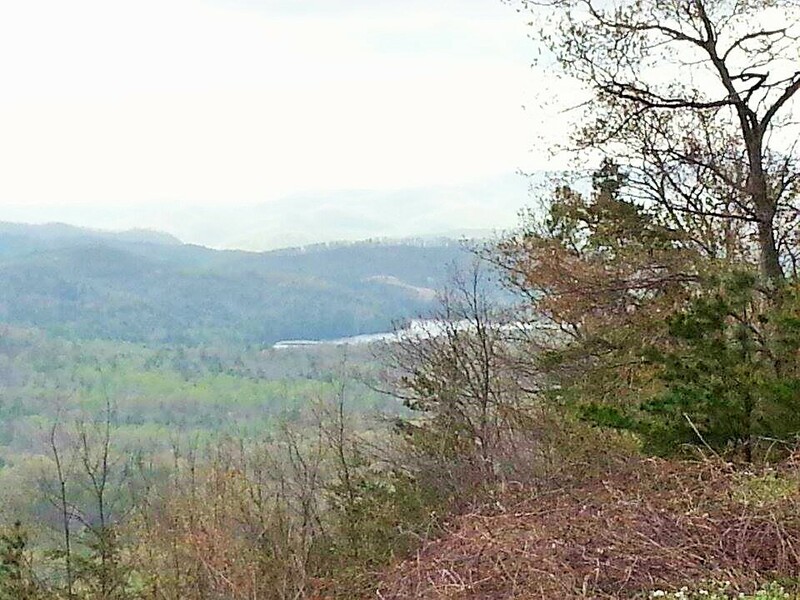 “The Dragon’s Tail” is a stretch of road that runs from eastern Tennessee into North Carolina. The road gets its name from its numerous curves, which give it a similar appearance to the tail of a dragon. Due to its turns, the stretch is known by motorcyclists and sports car enthusiasts as a great riding road, but the road also has proven a dangerous stretch. 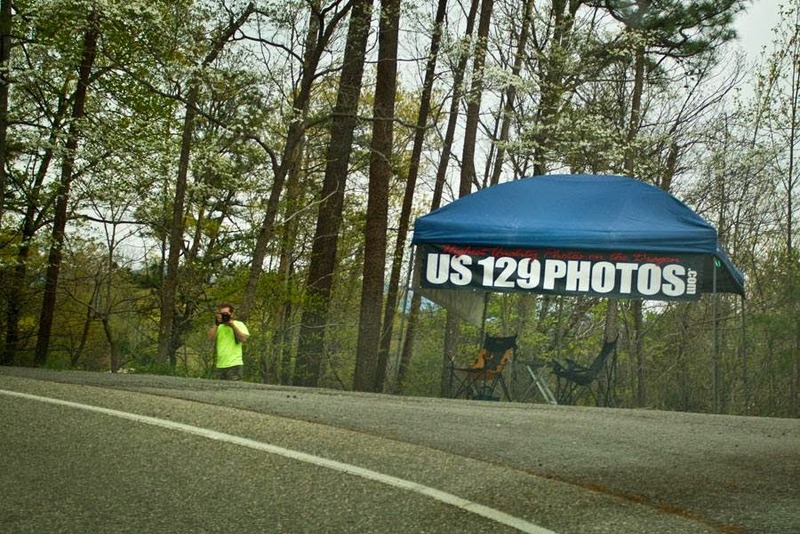 Designated US 129, the road is bordered by the Great Smoky Mountains and the Cherokee National Forest, with no intersecting roads or driveways to hamper your travel. It is considered “the destination” for thousands of motorcycle and sports car fans throughout the spring, summer, and fall. 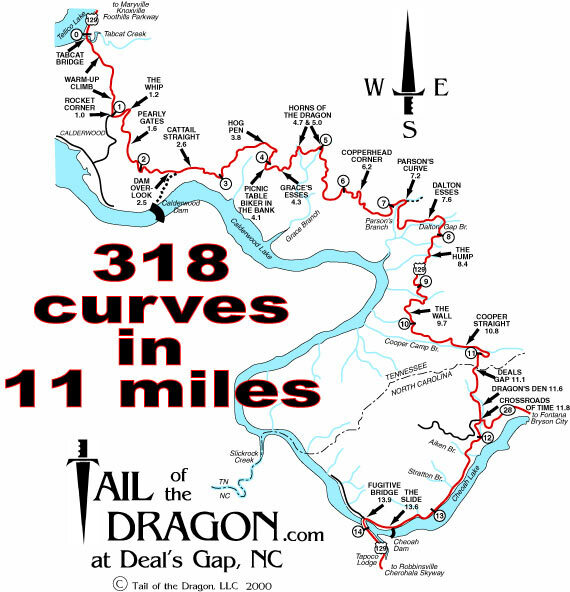 Tail of the Dragon consists of 318 curves in 11 miles, is America’s number one motorcycle and sports car road….It brings bikers and sports car enthusiast from all over the USA, and the world. The nearby Cherohala Skyway is quickly becoming a destination too, with its remote 60 miles of breathtaking scenic mountain highway. Julie said it was suppose to be sunny that day. It started off that way, but the farther we went, the clouds came. After couple of hours we finally entered the mountains. Chris took us the back way up. First we went through the Cherohala Skyway. So beautiful….breathtaking scenery….every curve was another gorgeous view. The smells as you drove were so wonderful. The smell of cut wood in the lower elevations, where there were homes dotting the country side, and as we climbed to the upper mountain areas, the smell of the forests and the flowering trees. Its a smell that never gets old. …..
.And then the smell of coming rain…..We stopped at an overlook and you could see the rain coming. We took off and sure enough……it rained….did we have rain gear? ….NO….but it wasn’t cold, so it wasn’t that bad. We dried up and then it rained again. 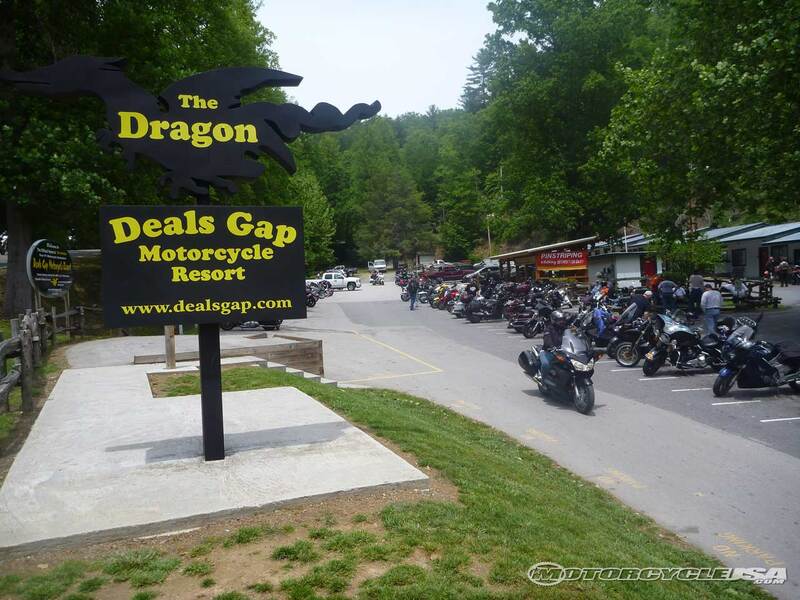 Finally we came to Deals Gap, Home of the Tail of the Dragon…..We were so wet. Julie gave me a sweatshirt to change to. We eat lunch of cheeseburgers, onion rings and French fries. Did some souvenir shopping and finally the rain stopped again. Deals Gap is a pretty cool area. You can rent a cabin right by the road, or tent camp. From their you can watch all the bikers and sports cars fly by. 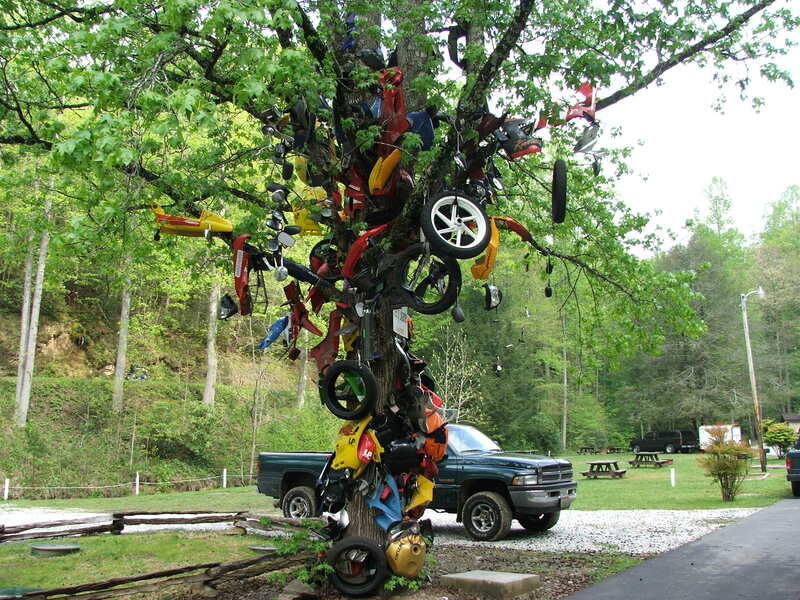 Their is a tree in the middle of the parking lot called….TREE OF SHAME….It is full of broken bike and car parts, that people have put in the tree, due to crashes. The road has many accidents and claims lives every year. Trucks over 30 ft. are not allowed on the road. Finally we took off again, almost dry. It had been several years, that Rich had rode me as a passenger on a bike, so we took it rather slow. It pays to be respectfull of dangerous roads, especially in the rain and when your not on your own bike. Well along we went and it rained again. Pretty much kept spitting rain the rest of the trip in the mountains. But the views and the ride was so worth it. We seen 1 accident, a crotch rocket had crashed. When we got their, he was up with his bike and ok, but the front was smashed and smoking. Lesson learned I hope…..lol….Around 5 times during the ride, they had photograpers taking pictures of you. The Cover Blog picture is one that was taken. I hate my picture taken as you know, but I decided to post this one. They can be bought online….What a great gimmick …..We stopped at the other end of the dragon, and the view was spectacular. In the distance you will see a dam. They call it The Fugitive Dam. It was photographed in the movie of The Fugitive with Harrison Ford. Finally we ended up out of the mountains, back in the main highways and traffic. It was at least another hour to the house. We returned to Julies house around 7:30 after riding over 300 miles. When I looked at the map, I realized that we were past Gatlinburg and half way back to Chattanooga, where we had been the day before……What an awesome day it was, even though it rained 50 percent of the time. It was on Rich’s Bucket list and now he has made another check off. lol…Great Ride…..Great Company….Great Day with friends from the past. Thanks Chris and Julie for the Great Memories of the day…….and Julie for letting Rich ride your beautiful bike….I have to add…..What a great seat….Wasn’t sore at all….Just a little damp…..lol…The next morning we took off. We were going to stop at another friend from the past, Anita. Another Plano friend that I haven’t seen since late 1990s….Anita was busy that day, so hopefully we can see her year another time. We worked together also for over 3 years. We shared some special times. Onward we went into Kentucky to see another friend Tammy. We crossed into Kentucky and went under the Cumberland Gap tunnel which is over 2 miles long. And guess what happened.